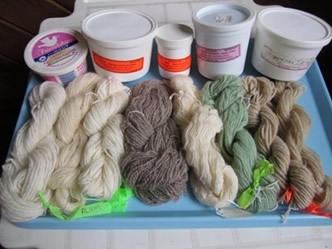 In this section, you will find many resources for learning about using fungi for dyeing fabric, making paper, and the rich history of the development of this art. These pages are an homage to pioneer Miriam Rice, whose work inspired an entirely new way to use mushrooms to create beauty. In the early 1970's Miriam Rice, a fiber arts teacher from Mendocino, California, discovered that many species of wild mushrooms were a source of pigments or colors. These pigments could be extracted fairly easily in hot water and used to dye natural fibers, especially wool. With the help of her friend and illustrator Dorothy Beebee, they published their results first in 1974 in the book Let’s Try Mushrooms for Color, with a second book published in 1980, Mushrooms for Color. A more recent book published in 2007 and reprinted in 2012, Mushrooms for Dyes, Paper, Pigments and Myco-Stix™, is more comprehensive and updates further exploration of mushroom dyeing, paper making from mushrooms, and using the pigments to make a crayon like Myco-Stix™. The use of fungi as a dye source was not entirely unknown before Miriam’s work. 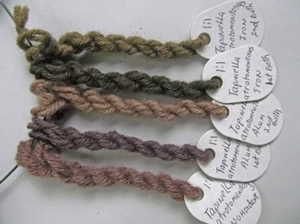 In her book Natural Dyes, Sources, Tradition, Technology and Science, Dominique Cardon devotes a large section of Chapter 10 to the historical use of fungi in dyeing around the world from as early as the 15th century. 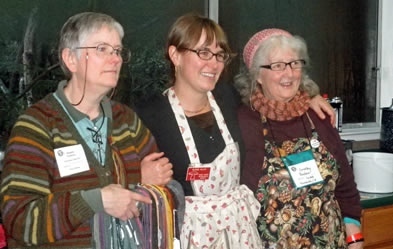 Miriam Rice is credited with "spreading the word" throughout the modern world about using mushrooms for color. Thanks to Carla Sundstrom, a friend of Dorothy Beebee, most participation and advancement of knowledge today is in Sweden, Norway, Denmark and Finland. The International Fungi and Fibre Symposium (IFFS) was formed to share this knowledge and promote all fungi-related arts and crafts. This gathering takes place about every 2 years in a different country under the sponsorship of the International Fungi & Fibre Federation (IFFF). The most recent was held in Otepää, South Estonia in September of 2014. 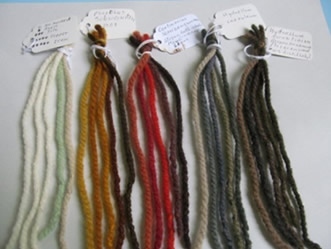 Highlights of the IFFS include an exhibition of handwork dyed or made from fungi, workshops on dyeing and related crafts, forays to hunt fungi with local mycologists and the sharing of dyed wool samples and memories. Read more about The History and Art of Mushrooms for Color in the words of Dorothy Beebee, who illustrated several books on this topic. 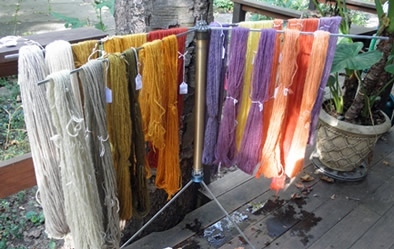 The basic procedure for dyeing with mushrooms is a variation of well-known historical natural dyeing. Dried mushrooms are preferred as the water content can vary greatly in a fleshy fruiting body. By drying the mushrooms first, the pigments are concentrated and a more accurate ratio of mushroom to fiber can be recorded and then repeated later. Wool, a protein fiber, is the best fiber to take up the dye rather than cotton or plant based cellulose fibers. Silk dyes well but is fragile to work with. Preparing the wool for dyeing is best done as a separate step beforehand. Mordants are chemical salts which help fix the pigments to the wool fibers as well as affect the color obtained. They also improve lightfastness or how much the color will fade over time. There are all kinds of mordants but the best for mushroom dyeing are alum and iron. Most of the rainbow of colors can be obtained using dyer’s alum (potassium aluminum sulfate) with the correct species of fungi. Iron (ferrous sulfate, aka copperas) can be used for a different range of colors from the same fungi species that are usually darker or "sadder". Tapinella atrotomentosus (formerly Paxillus atrotomentosus) dyes a rich dark green on iron-mordanted wool using a 1:1 ratio or 1 ounce of dry mushroom to 1 ounce of wool while on alum-mordanted wool it will dye a strong gray. The age of the fungus at the time of picking can affect the final colors. Some are better when picked young like Phaeolus schweinitzii for a lemon yellow with alum while other species are best when fully mature. 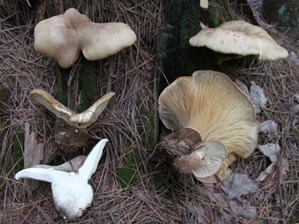 The richest blood reds are from mature caps of Cortinarius semisanguineus or mature whole C. sanguineus, both with alum as the mordant. Another factor affecting color is the pH, i.e., whether the dye bath is basic or acidic. For some species, including all the tooth fungi, raising the pH to 8-9 may improve the color from a nice green to a rich teal or blue-green. This pH adjustment should be done when the mushroom is first cooking by adding ammonia (3%) or washing soda (sodium carbonate) to raise the pH or by adding white vinegar (5% acidic acid) to lower the pH. Registration opens March 1; early registration is recommended. Details can be found at http://fungiandfibre2016.org. 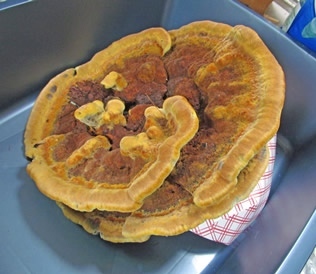 A brief description follows for the basic steps for mushroom dyeing — refer to one of the books on the reference page or the dyeing protein fibers page for more details. Decide on a ratio of dry mushroom to fiber (wool). It is usual to start with a ratio of 1:1 or 1 ounce dry mushroom to 1 ounce wool. Break up the mushroom into as small as pieces as possible and place into cheesecloth bag. Soak overnight in distilled water or for as long as possible. Cook the mushrooms for 1 hour at a simmer, 170-180°F. DO NOT BOIL. Adjust the pH within the first 10 minutes of cooking. Cool down dye bath before adding premordanted wool. Wool and dye bath must start at the same temperature. Dye bath is ready to use again if strong enough for successive baths called afterbaths.